No floundering about for Dad – he’s a dab hand at catching fish! Last year Unring came back with one flounder at about this time of the season. This year he has brought back 2! Is he flying the 10 miles or so to the seaside or are the flat fish swimming up to meet him? As well as the flat packed offering he also presented his offspring with 2 pike! Which to eat first? Well the pike were easier to hold and more familiar but eventually the bony flounder was eaten too. A week ago having traveled over twelve thousand miles and over thirty countries Number 14 decided to add a few lakes to his collection. On Saturday 15th at 8.00 he was on Ullswater, 9.00 to 10.00 Haweswater, crossed Windermere by 1200 and then visited the Duddon Valley at 1300. The afternoon was spent on the sands near Ulverston before crossing near to his cousins at Foulshaw Moss before heading for the Eden once again near Penrith. 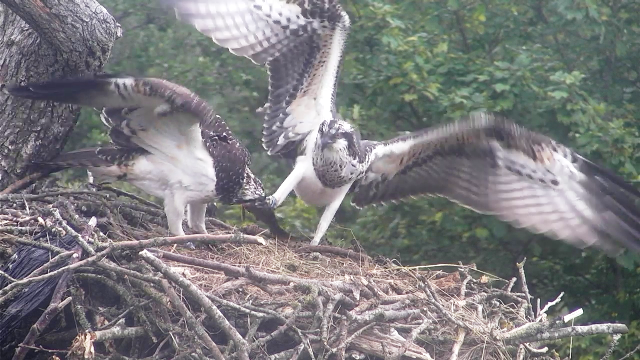 Meanwhile this afternoon on the nest we had sibling rivalry caused by a rather small fish. V0 and V1 along with Dad are still to be seen around Bassenthwaite while Number 14 could appear, it seems, anywhere. We are now entering the last week of the 2015 season so come along to Dodd Wood or Whinlatter to gather a few memories for the long winter. Many thanks to Jonathan Pruskin on loan from Leighton Moss for capturing the above image. 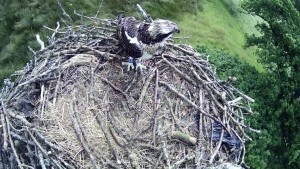 Wall to wall, ceiling to floor, rain today and a very disgruntled V1 stood hunched and dripping on the nest. 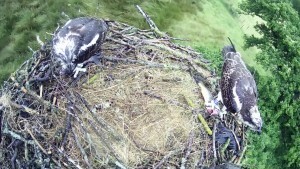 Then, just after 10.00 Dad flew over and chucked her a beautiful trout to cheer her up. At first it seemed even this couldn’t brighten her day and she sat alternately mantling and crying over it, with the water trickling down the back of her neck. At last she got herself together and had a few nibbles. Not so bad after all! A couple of hours later there was an action replay. Zoom! Splat! Another fine fish dropped right in front of V0’s beak. 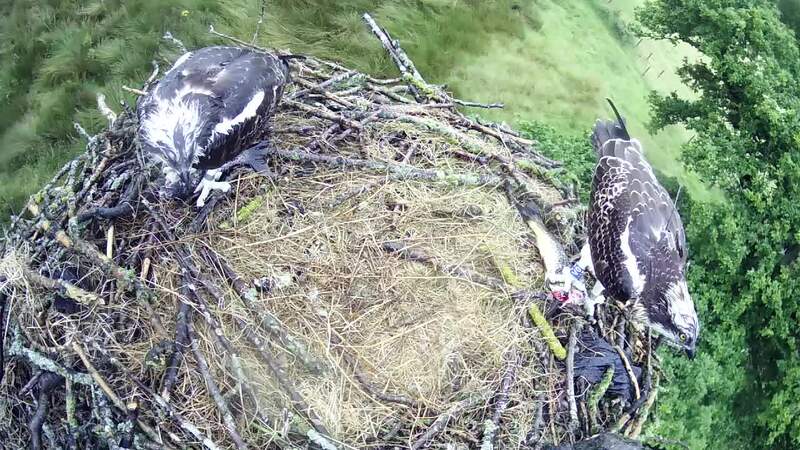 No messing with this lad; he got straight into his meal, ate it all and left the nest before his sister had worked her way to the tail of hers. 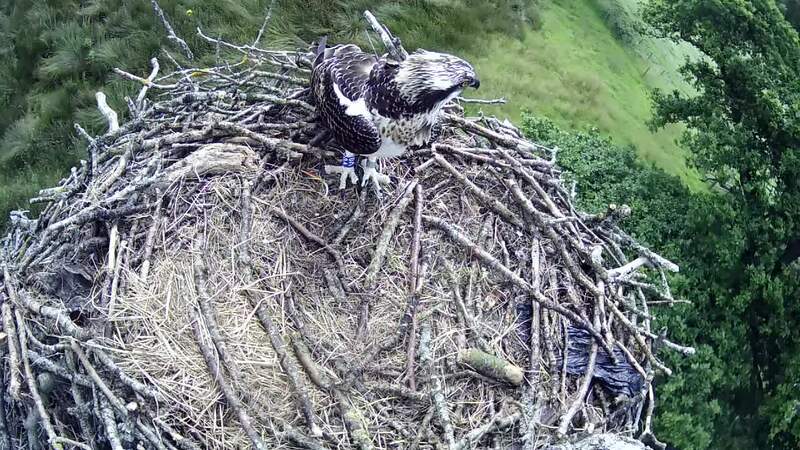 Meanwhile, back on the nest…. To go back to our tyro flyers. 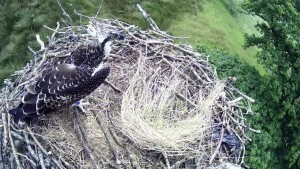 After a shaky start V1 (Oscarina) has been gaining confidence and strength. She, sensibly, did not ground herself again after the initial flight and spent some days hopping from tree branch to tree branch. Her cries of hunger were heard by Dad and he dropped a few fish her way so she could practice jumping to the next branch. At last she made it back up to the nest and now is making short circular flights, keeping ‘home’ well in sight. VO (Gale) has continued to fly strongly and is now ranging further over the marsh, although we have not yet seen him try to fish.Instead he is dogging Dad, demanding fish voraciously. This morning Unring arrived quietly on the nest to do a bit of housework but was unexpectedly pounced apon by his son who shouted loudly down his ear. Unring flew off looking a bit ruffled. 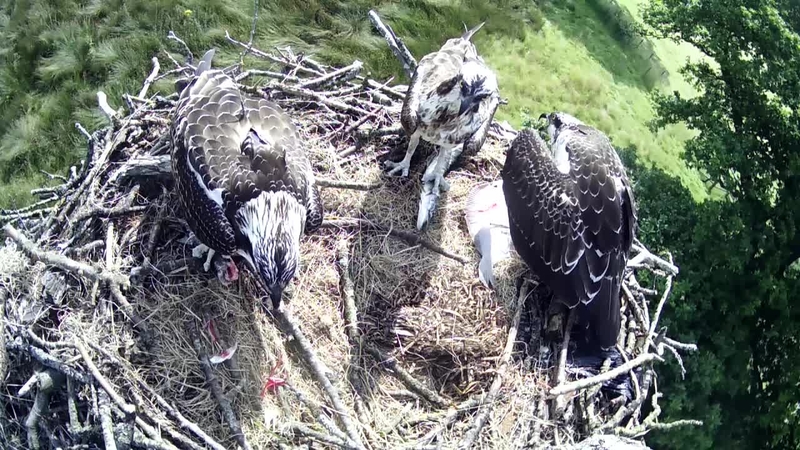 When he did return with a fish he didn’t bother to land, just flew over and dropped it in front of V0. Presumably he didn’t want his other ear bashed.